After my second time in that city, I can claim I will come back again. Amsterdam is an amazing city. While walking in the downtown you feel you walk though the years, however, when you look forward you realize you are walking in a cosmopolitan city full of life. 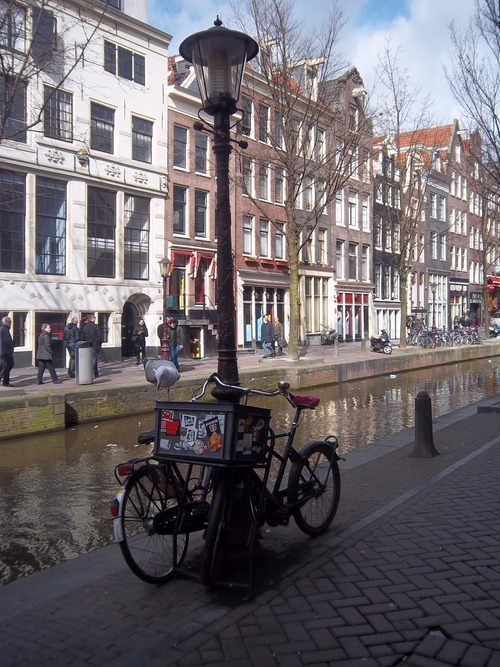 Getting lost across its canals and bridges allows you to see beyond the “Red Light District” and the famous Coffee Shops. In any corner or street you can find a wide variety of cafeterias and restaurants whose decoration motivates you to go inside them. Also, there are so many street styles and groups that you can easily find a huge offer of products (vintage, vegans…). Of course, we can´t forget the importance of the city in the European history. Starting from the foundation of the “Dutch East India Company”, mentioning the story of Anna Frank and ending with the importance of its well-known international beer: Heineken. So, you can always find something to do in this interesting city. You can walk in Dam square, to visit the Rembrandt museum or to have a “Heineken experience” (One day, as a good Marketing girl, I will write a post about it;). Finally, I must mention the famous “Red Light district”. No matter when you visit it, you can always find people walking around, drinking beer (and other stuff) in the “Coffee Shops” and, of course, watching the girls who work in the stalls. Amsterdam has more than 150 canals and 1200 bridges within its bounds. The name of the city comes from the combination of the river Amstel and the Dam that was built in order to found the original village.